Our delicious Cheesy Southwest Pasta-Turkey Skillet is the perfect dish to serve on a busy weeknight. 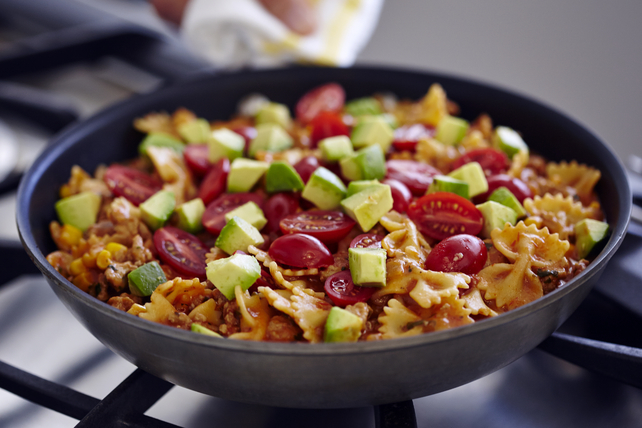 Made with ground turkey, salsa, pasta and vegetables, this comforting, cheesy pasta is sure to become a new family pasta night favourite. Cook onions in large nonstick skillet on medium heat 4 to 5 min. or until softened, stirring occasionally. Add turkey; cook 8 to 10 min. or until done, stirring occasionally. Add salsa, water and pasta; stir. Bring to boil; cover. Simmer on medium-low heat 14 to 16 min. or until pasta is tender. Stir in corn and cilantro; simmer, uncovered, 5 min. or until reduced to desired consistency, stirring occasionally. Remove from heat. Stir in cheese. Top with avocados and tomatoes. For added flavour and a touch of heat, top with 1 sliced fresh jalapeño pepper along with the avocados and tomatoes. Serve with a mixed green salad to round out the meal.